Released in November 1977. 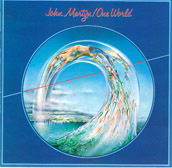 One World was critically acclaimed, was commercially accessible and sold well, charting at number 54. It contains a variety of styles and moods from the dubbed Big Muff co-written with Lee Perry, to the incredibly romantic Couldn’t Love You More which has been reworked and recorded many times since and is still a great favourite with his fans. The album closes with the mesmerising “Small Hours”, a ‘live’ echoplex excursion featuring a flock of Canadian geese ! One of the all time great chill-out tracks which was later adapted and re-recorded as Anna for the Australian feature film In Search of Anna. Unfortunately a sound track was never released, but a small number of live performance tapes featuring Anna are in existence. Island released Dancing / Dealer as a single in January 1978.